Wayne Dyer, Ph.D, is a psychotherapist, lecturer, and inspirational speaker on spiritual growth and personal development. He is the author of the best-selling book, Your Erroneous Zones. In it, he reveals how you can take charge of yourself and break free of the facets of life that act as barriers to success and happiness. Dr. Dyer has written many other Self Help classics, including the bestseller 10 Secrets for Success and Inner Peace. Just after he was born, his father walked away from his family. Dr. Dyer spent his childhood in orphanages and foster homes, but he sees this as the way he learned the valuable lesson of self-reliance. He has overcome many obstacles to make his dreams come true and today spends much of his time showing others how to do the same. His message is that as spiritual beings, we possess unlimited power to recreate our lives. Dr. Dyer received his doctorate in counseling psychology from Wayne State University. When he’s not traveling the globe lecturing and delivering his uplifting message, he is writing from his home in Maui. He contributes to a number of professional journals and is affectionately called the “father of motivation” by his fans. Dr. Dyer has appeared on thousands of television and radio shows and has been interviewed in dozens of popular magazines. 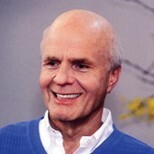 To view his updated schedule, visit his website at www.drwaynedyer.com. • Everything you need you already have. You are complete right now. You are a whole, total person, not an apprentice person on the way to someplace else. Your completeness must be understood by you and experienced in your thoughts as your own personal reality. • I will grow. I will become something new and grand but no grander than I now am. Just as the sky will be different in a few hours, its present perfection and completeness is not deficient, so am I presently perfect and not deficient because I will be different tomorrow. I will grow and I am not deficient. • Go for it now. The future is promised to no one. • Did you ever notice how difficult it is to argue with someone who is not obsessed with being right? • People who want the most approval get the least, and people who need approval the least get the most. • The measure of your life will not be in what you accumulate but in what you give away. • You are always a valuable, worthwhile human being—not because anybody says so, not because you’re successful, not because you make a lot of money—but because you decide to believe it and for no other reason. • When you squeeze an orange, orange juice comes out—because that’s what’s inside. When you are squeezed, what comes out is what is inside. • Love is the ability and willingness to allow those that you care for to be what they choose for themselves without any insistence that they satisfy you. • You cannot be lonely if you like the person you’re alone with. • Your children will see what you’re all about by what you live rather than what you say. Dr. Wayne Dyer is a legend in the Self Improvement arena and has touched millions of lives. His blockbuster book, Your Erroneous Zones, first published in 1976, is still hugely popular and what I believe to be the best place to start. This bestseller provides a truly profound message—avoid the trap of negative thinking and self-rejection and focus on authentic self-acceptance. In the introduction of the book, Dr. Dyer provides a list of 25 questions designed to measure your capacity to choose happiness and fulfillment. A few of the questions in the introduction include: “Are you capable of controlling your own feelings?”, “Can you accept yourself and avoid complaining?”, and “Have you eliminated procrastination as a lifestyle?”. Your Erroneous Zones expands, articulates, and instructs us in each area, and the chapters are written like a counseling session, providing us with valuable tools and insights. Six million copies of the book have been sold. If you prefer listening to Dr. Dyer on tape, Your Erroneous Zones is also available on audio cassette.